The most important place in all the Land of Een is the Elder Stone, for it is here where the Council of Elders meet to discover important matters. The Elder Stone towers above the Een shops and homes in the town of Faun’s End like a castle. 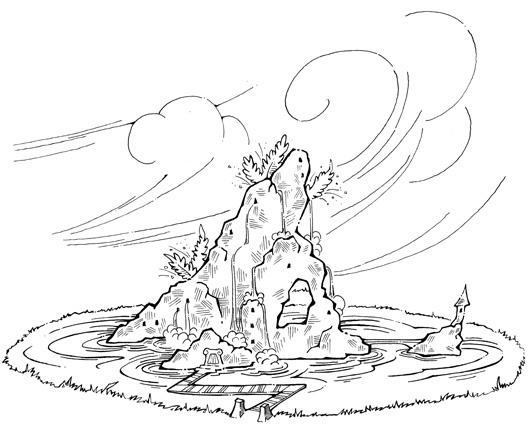 It is built from a single gray rock that thrusts towards the sky; legend holds that it took hundreds of years for the ancient Eens to fashion the stone to their design. The inside of the Elder Stone is hollowed out and tunneled with countless rooms and passageways, while much of the outside is carved with tiny stone pictures of stars, animals, and strange Een faces with all manner of expression. Some of these faces frame tiny windows and doorways, while others gaze upon the distant ground with long open mouths that gush sparkling waterfalls. These falls glisten in the sunlight, changing color as they tumble down the Elder Stone from ledge to ledge, spilling at last into a narrow moat that surrounds the rock’s base. From here, a series of pumps and pipes return the water to the top of the stone, so that the frolicking water might repeat its journey. The Elder Stone also contains a few personal living chambers. Traditionally, the Eldest of the Elders makes his or her residence here. There are many secret doors and passageways in the stone and in its cellars are vast vaults that hold many important Een treasures, including the Box of Whispers. Throughout different times in Een history, the bottom most caverns of the Elder Stone have also been used as a dungeon.